I have also written letters and emails to some very famous people. These are mostly the authors whose work I like. One of the German authors I had written to even invited me to his office if I happen to visit Germany. 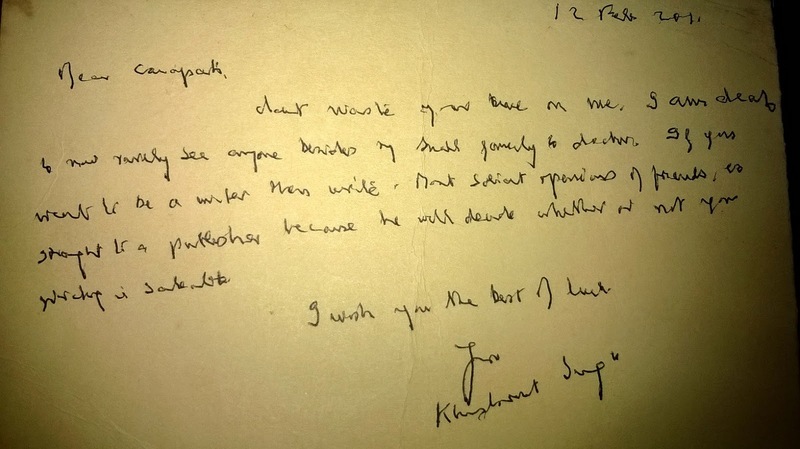 But the most important letter I have received so far is from perhaps the most famous and best sardar ever, the one and only Khushwant Singh. I have not read much of his works, but one fine day, while reading a magazine I happened to chance upon his address. Straight away I wrote a letter to him, expressing my liking for him and my dream to become an author someday. At the time of writing the letter I didn't even know if the address is proper, whether he would read the letter and so on. I forgot about the letter once I wrote it. I didn't even remotely expect a reply from him. But then again, he is known to be a great man. And one fine day I find this in my mail. Wish you all the very best . Hope to see your work soon ..